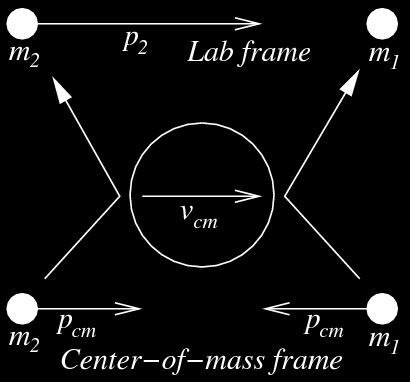 Figure 1: Illustration of the lab frame and center-of-mass frame, drawn to satisfy classical addition of the velocities if the masses are set to 1. Relativistic velocity addition is not so simple. However, I do nuclear physics experiments, where we play different games than the particle physicists. One is to make precise measurments at low energies that are relevant to astrophysics: for reactions in stars, novae, supernovae, and big bang cosmology. Another is to perform experiments with beams of radioactive nuclei, to study exotic nuclei to further our understanding of nuclear structure. So enough of this particle physics talk about big accelerators! Since s is just a constant, this equation determines pcm. pcm is the momentum of both particles in the center-of-mass frame. To determine the rapidity of the center-of-mass frame, we consider that a boost to the target with the cm rapidity gives the taget the momentum pcm. Figure 2: Triangles formed by the reaction momenta and angles in the cm and lab frames. 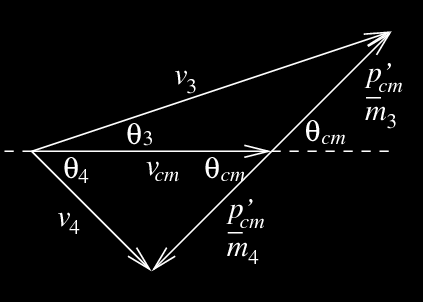 The picture is strictly classical, using Galilean addition of the velocities, and v3 and v4 in the cm frame (on the right side of the triangle) would be equal and opposite if and only if m3 equals m4. Given Ek and all the masses, p'cm is just a number. Applying a boost with the cm rapidity gives the momenta and energies of the products as a function of the cm angle. The only undetermined parameter is the cm angle. The game we usually play when doing nuclear physics experiments is to determine the probability for a given reaction to happen, either as a function of the cm energy, or as a function of the cm angle, or both. All measurements are made with detectors in a laboratory environment, so it is important to convert readily between cm and lab quantities. When this condition applies, the positive sign gives the high-energy reaction products, the positive and negative sign solutions become equal at the maximum lab angle (the term under the radical becomes zero), and the negative sign solution gives the low-energy reaction products. This condition usually applies for one of the reaction products in nuclear physics experiments, because beam energies are generally small compared to nuclear masses on the order of many GeV. The lighter reaction products, on the other hand, often have no maximum lab angle. Since the magnitude of the momentum can never be negative, in this case the positive sign is correct. To confuse persistent readers, the notation has been changed. pcm no longer has the apostrophe but it still refers to the center-of-mass momentum of the products. The θ without the subscript is a lab angle. And Ecm is the center-of-mass energy of the paricle in consideration. This equation is for the ejectile. The only difference between the ejectile and the recoil is the minus sign, so the result is the same for the recoil with a minus sign in front of the cos(θcm) term. To make plots of lab energy vs lab angle using these equations, try the Relativistic Kinematics Calculator for Two-Body Nuclear Reactions. Please send any questions, comments, or suggestions to Sky. My initials look like ski tracks.